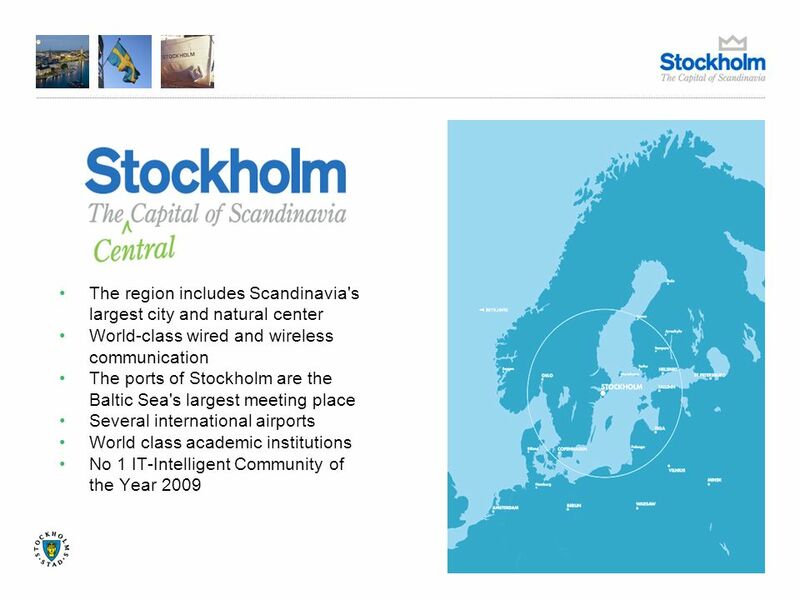 33 Best ICT infrastructure in the world Source: Connectivity Scorecard 2010 1.Sweden 2.US 3.Norway 4.Denmark 5.Netherlands 6.Finland 7.Australia 8.UK 9.Canada 10.Japan The worlds biggest open fiber network. 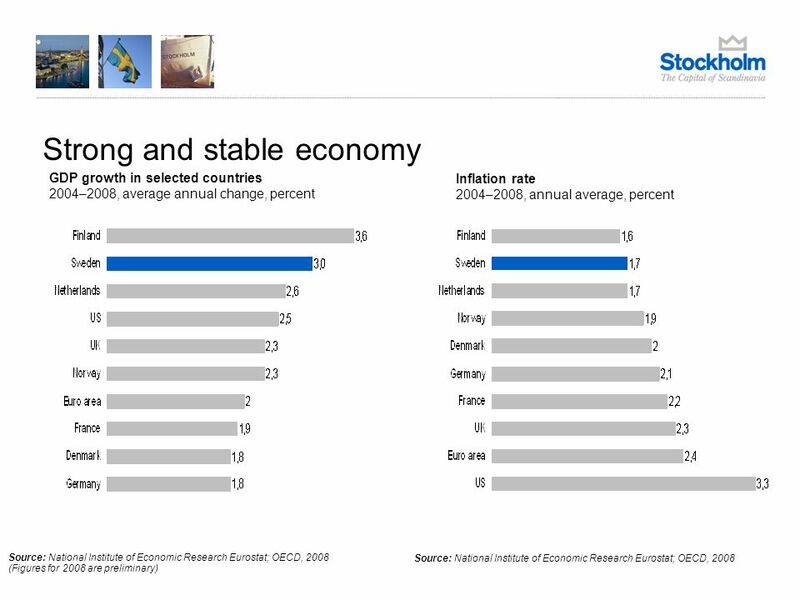 High usage of computer, internet and mobile phones. 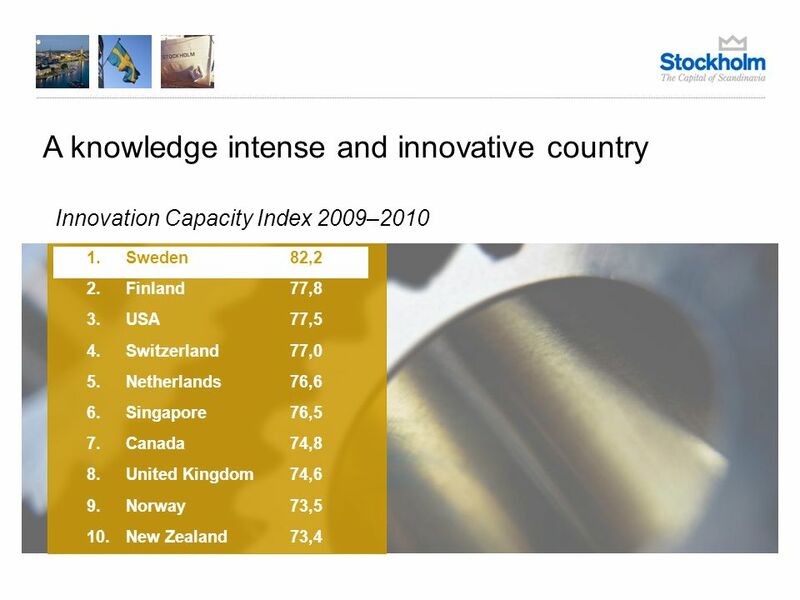 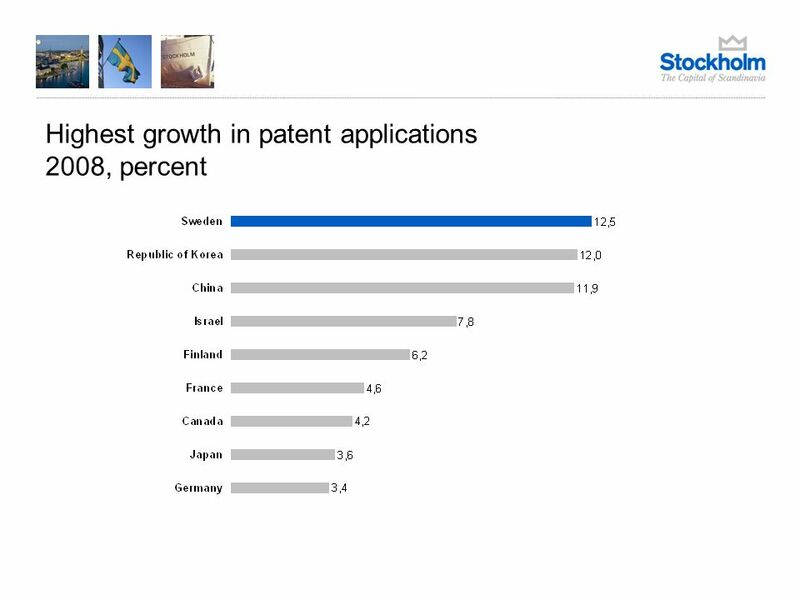 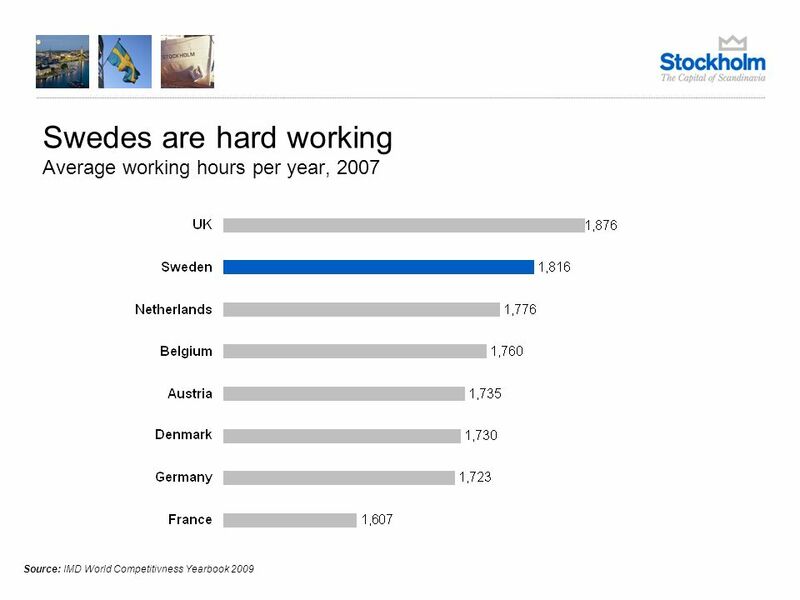 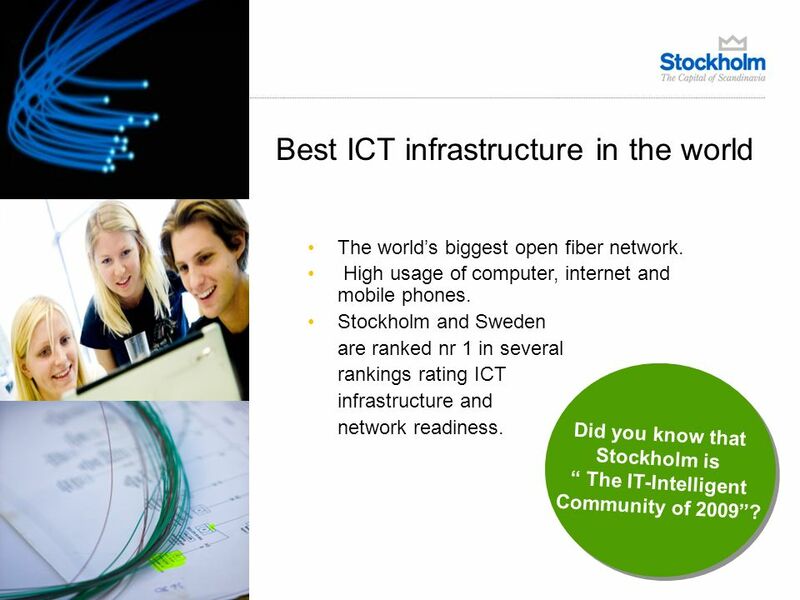 Stockholm and Sweden are ranked nr 1 in several rankings rating ICT infrastructure and network readiness. 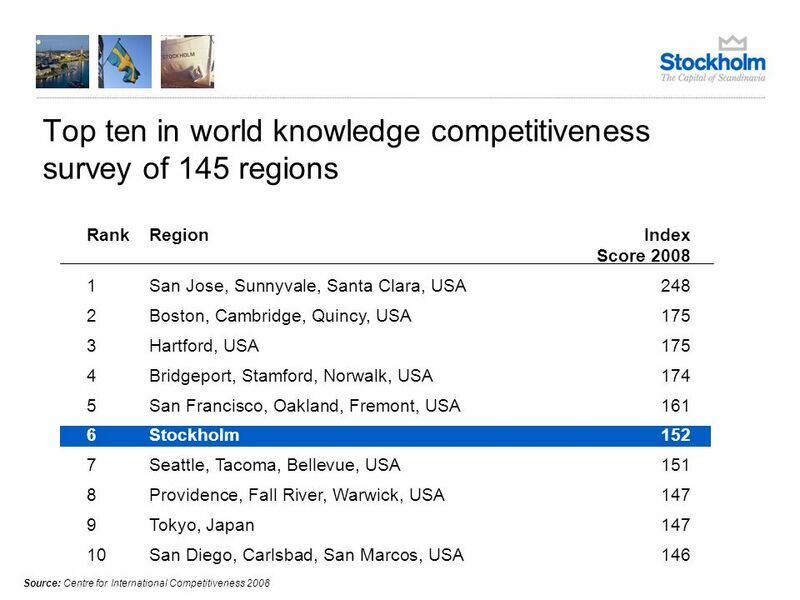 The Intelligent Community of 2009? 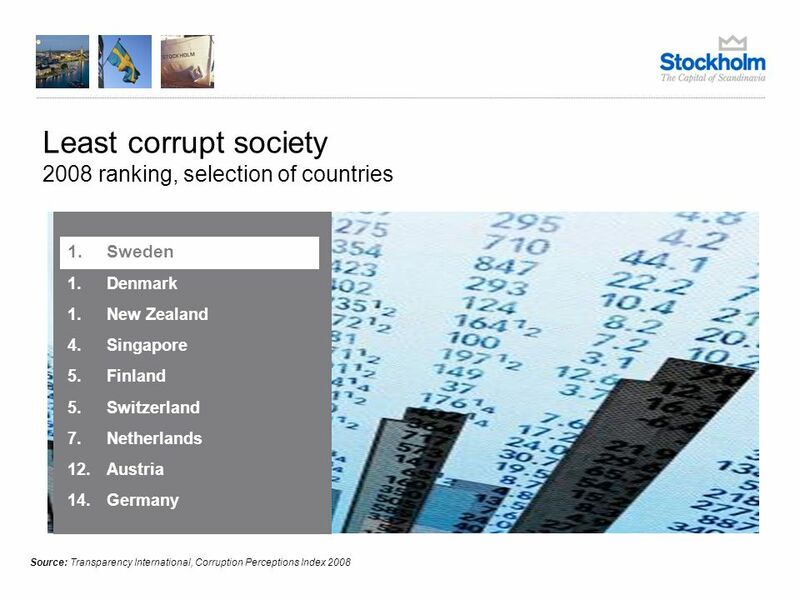 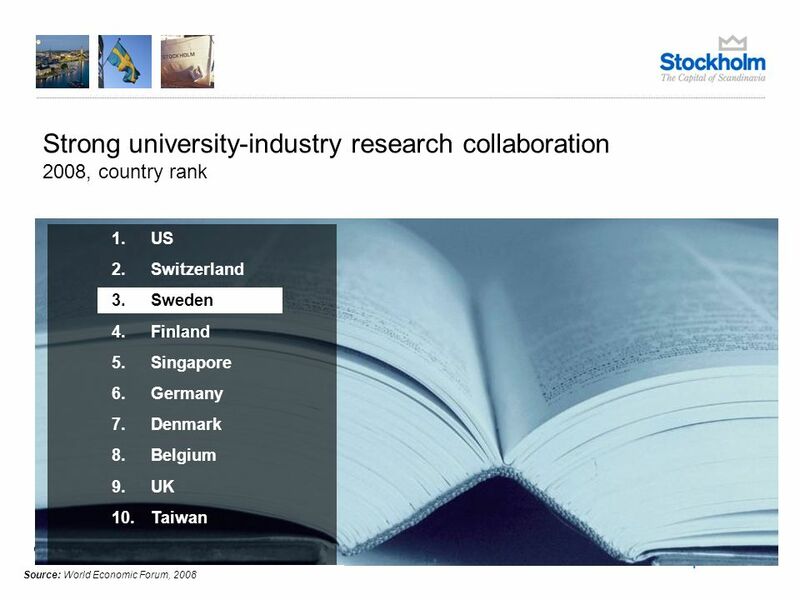 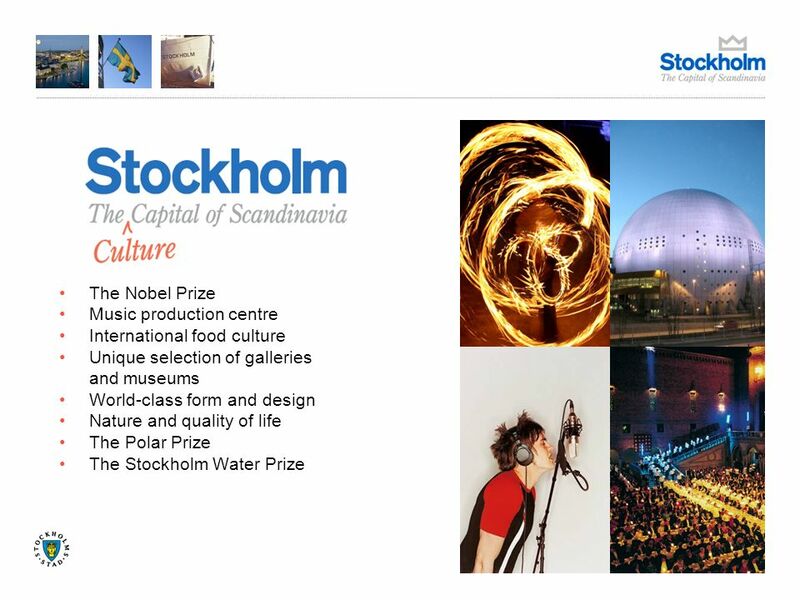 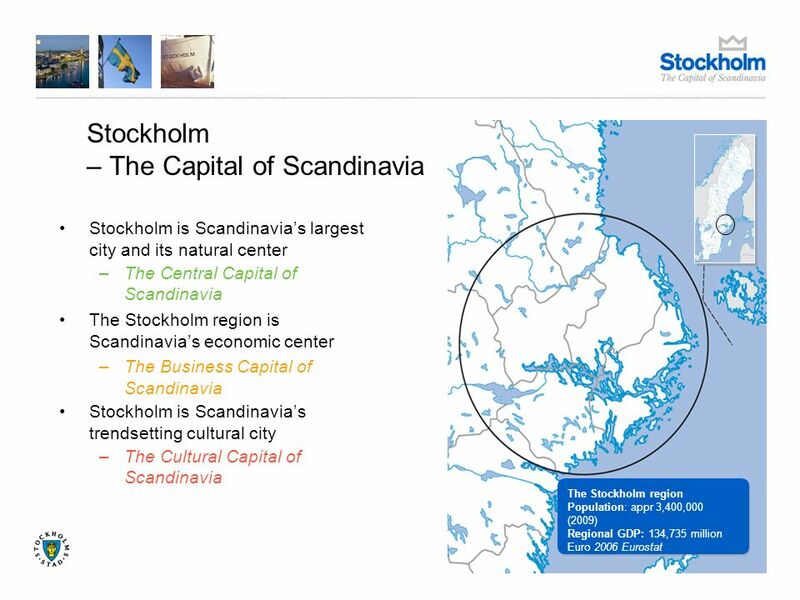 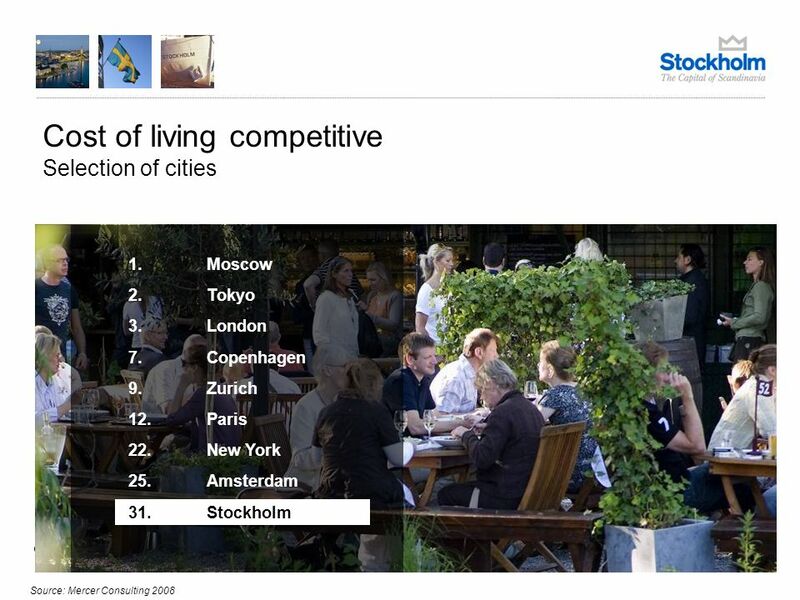 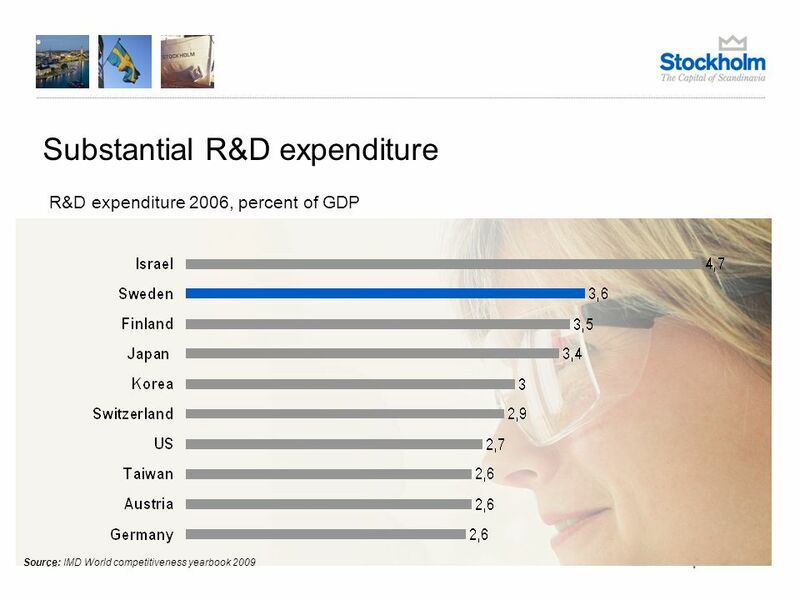 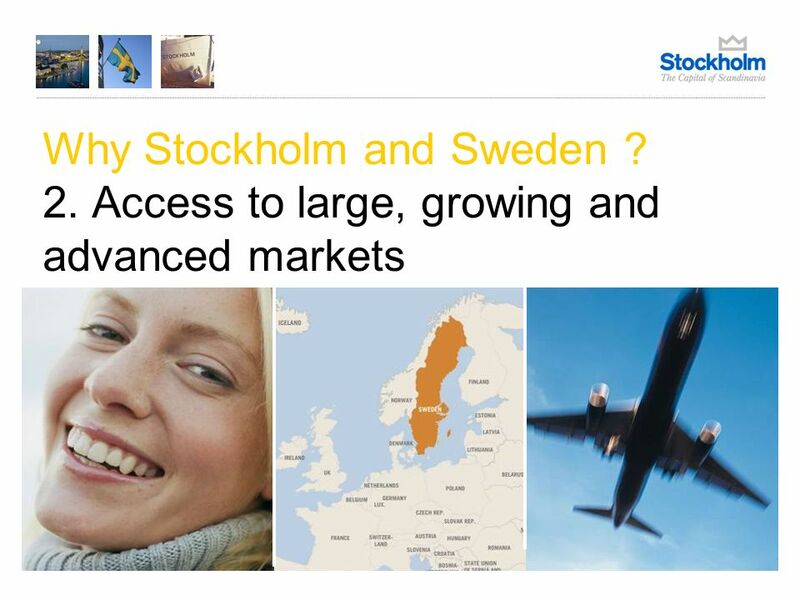 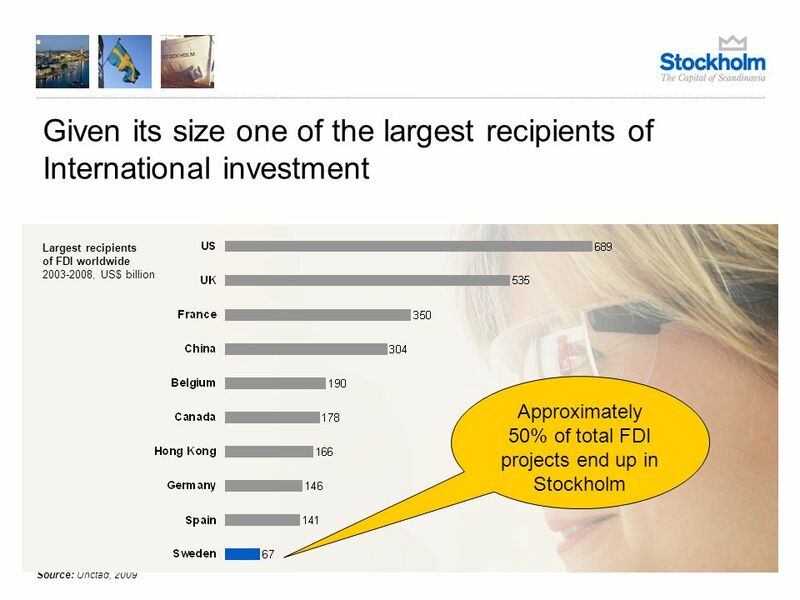 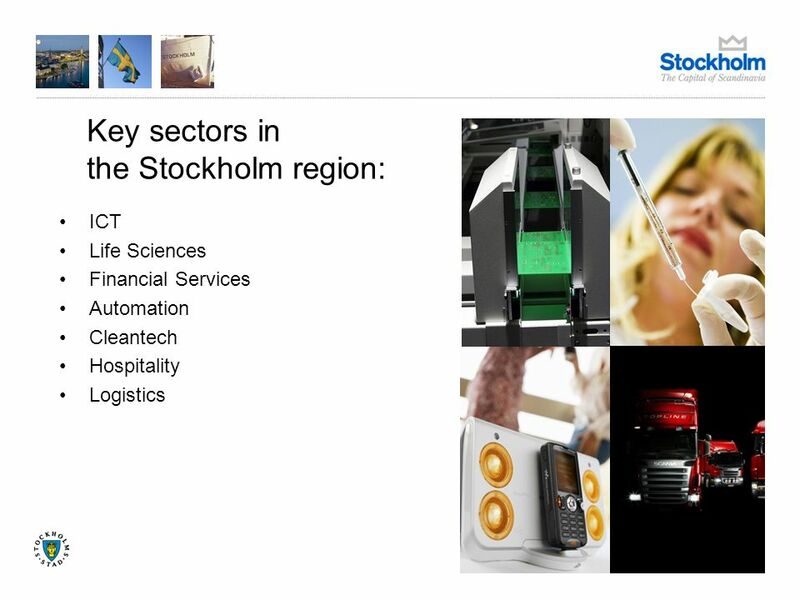 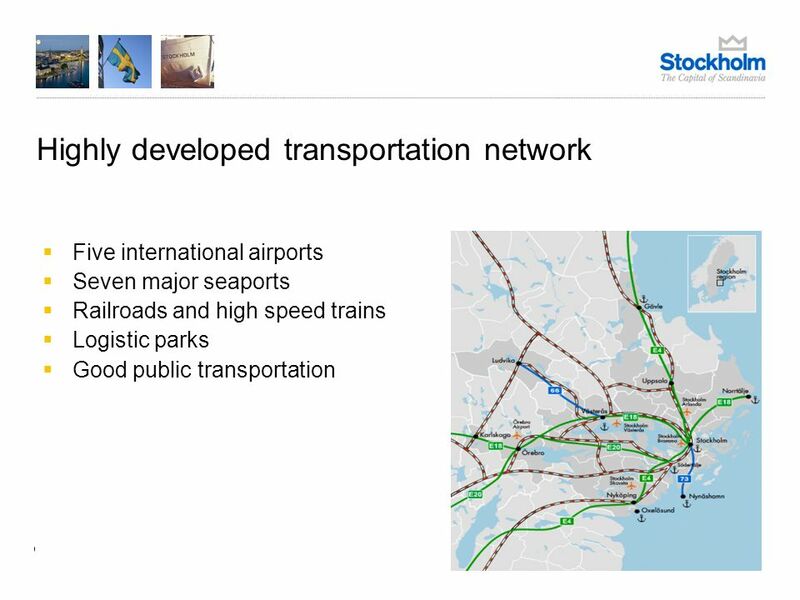 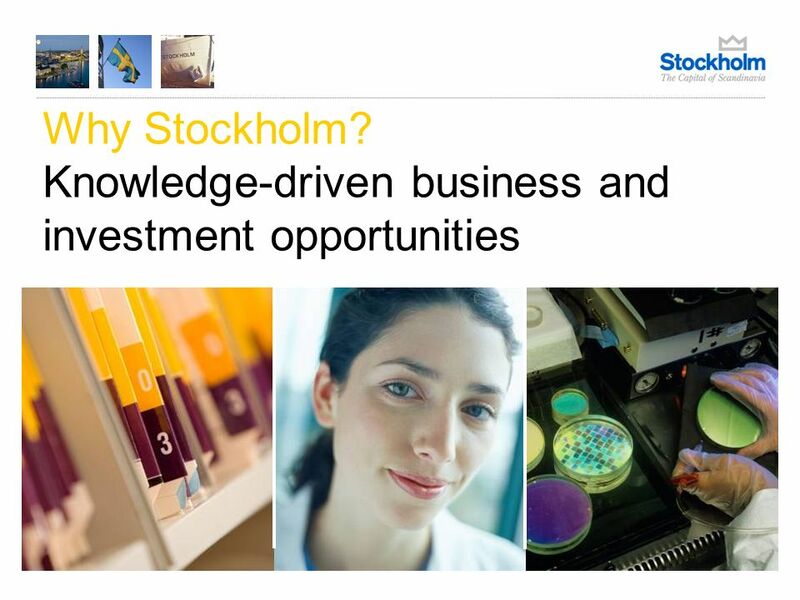 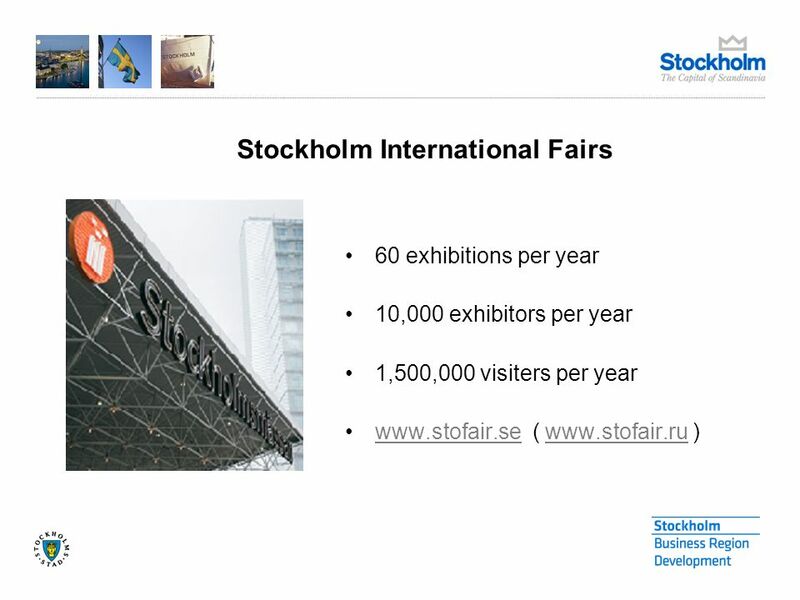 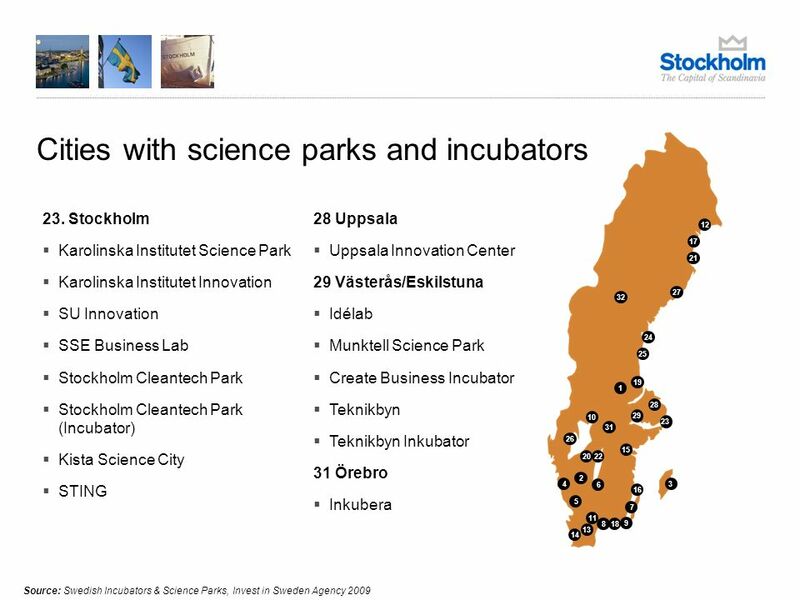 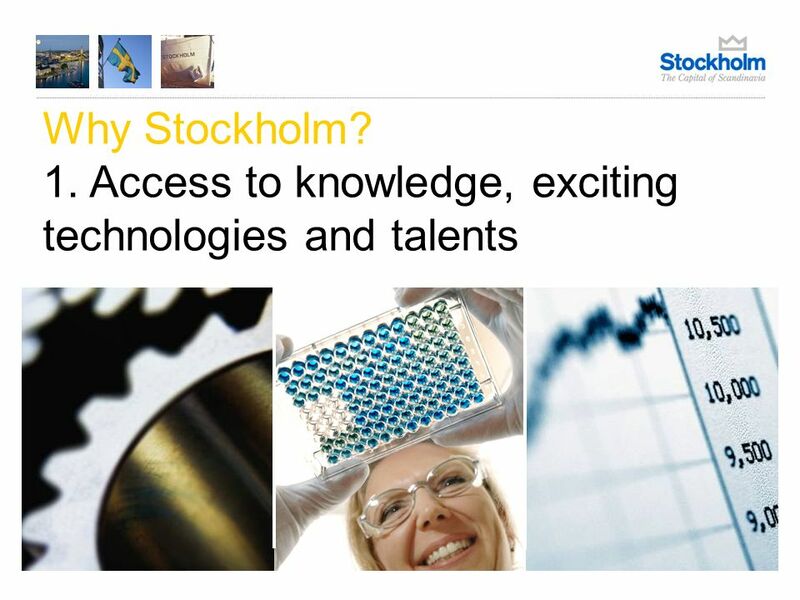 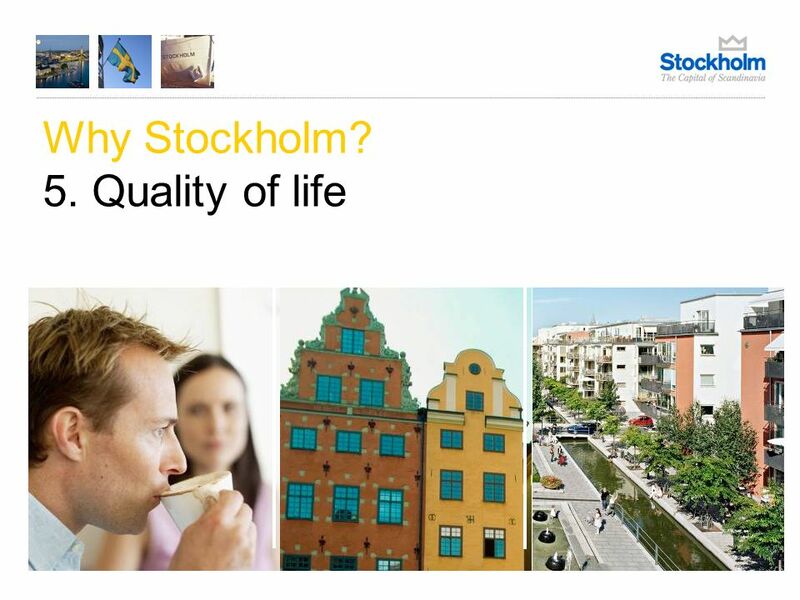 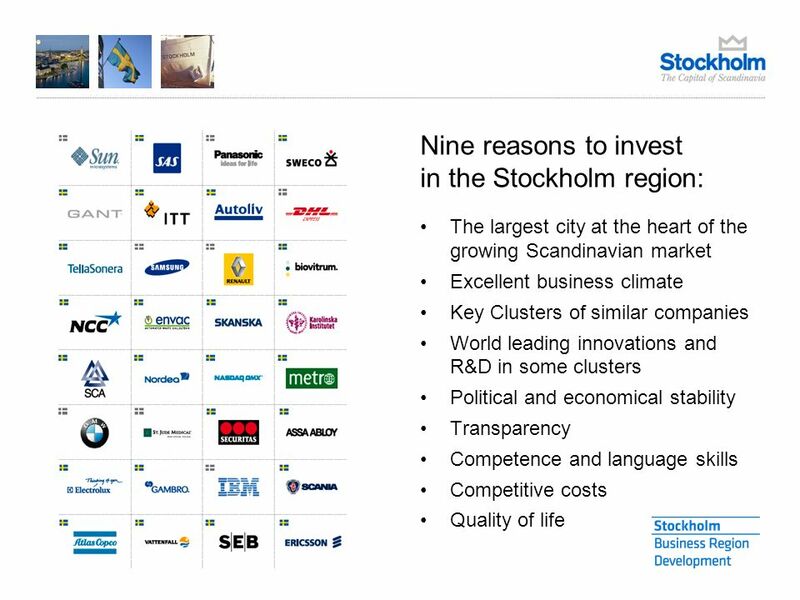 Did you know that Stockholm is The IT-Intelligent Community of 2009? 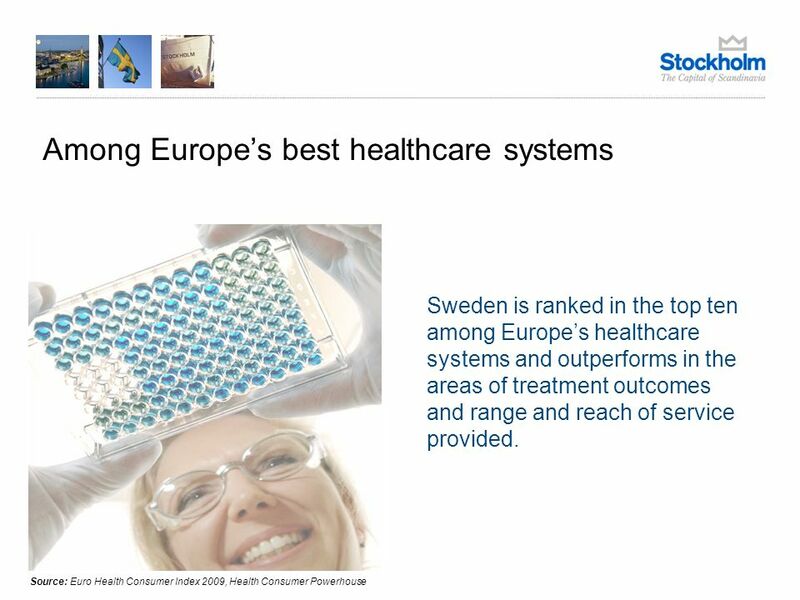 40 Among Europes best healthcare systems Source: Euro Health Consumer Index 2009, Health Consumer Powerhouse Sweden is ranked in the top ten among Europes healthcare systems and outperforms in the areas of treatment outcomes and range and reach of service provided. 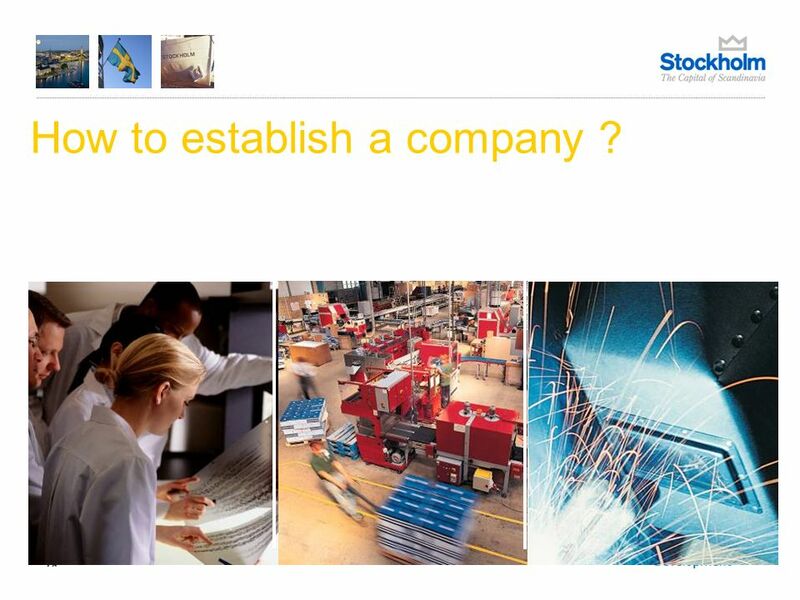 41 How to establish a company ? 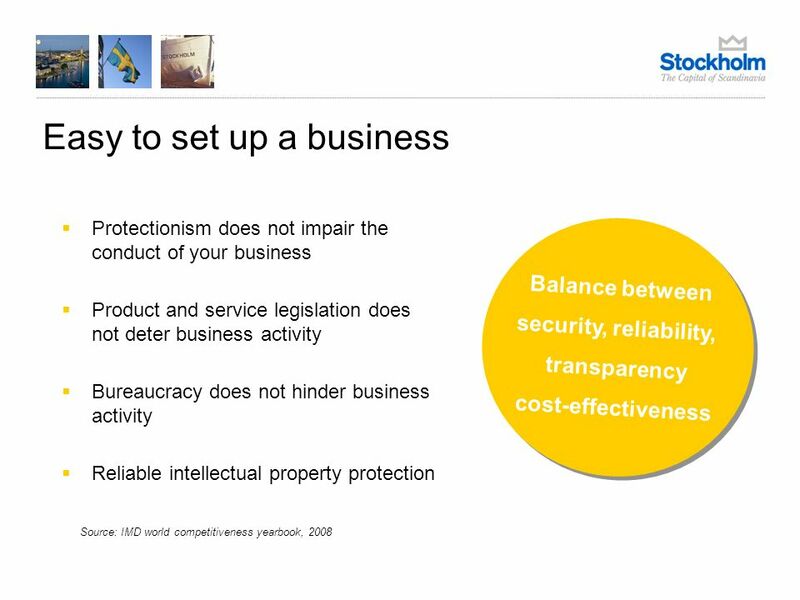 43 What type of business? 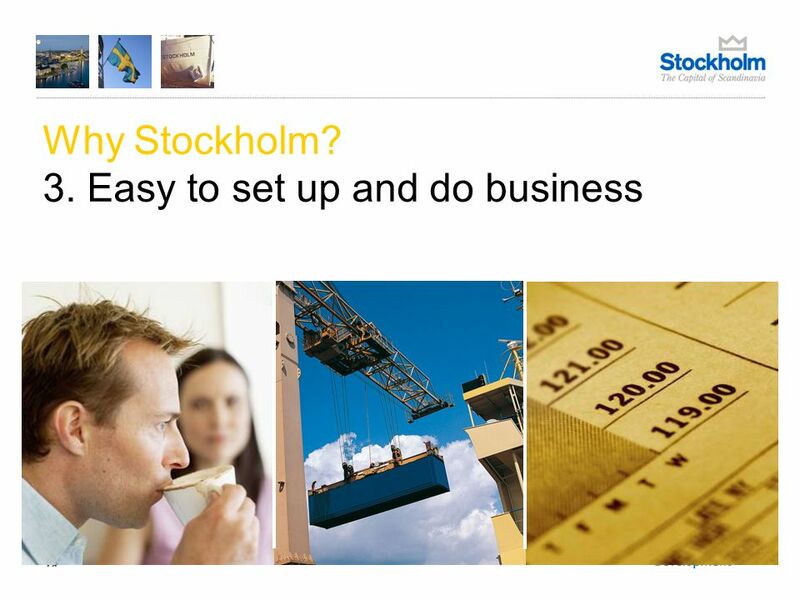 Sole trader Sole trader may be appropriate if you are going to start a business on your own. 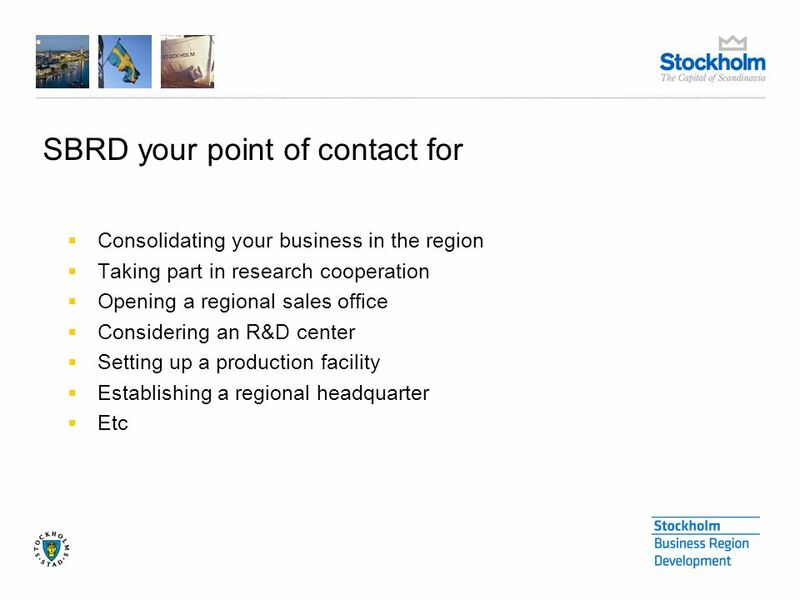 You are not required to put up any capital, but there is no clear dividing line either between you personally and your business with regard to finances Trading partnership / Limited partnership A trading partnership is an alternative if at least two individuals wish to start a business together. 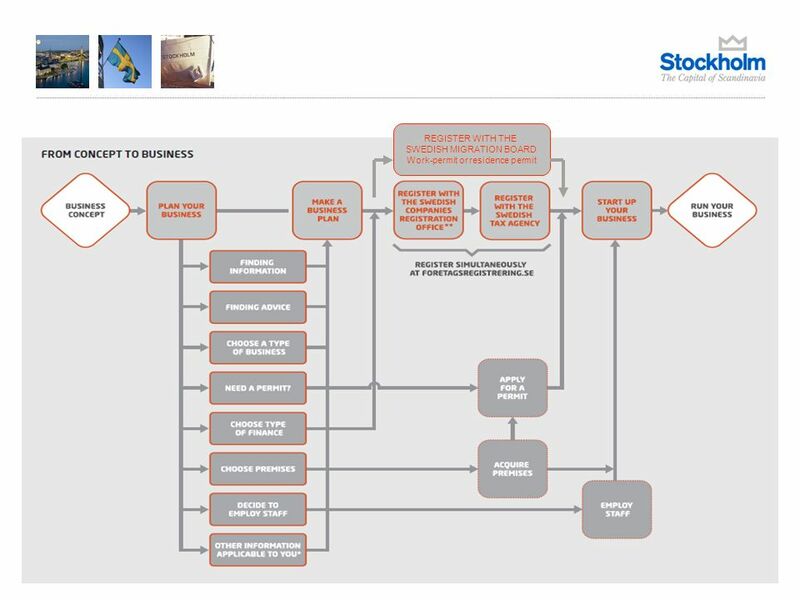 There is no requirement to invest capital, although the partners are personally, jointly and severally liable for the company's debts. 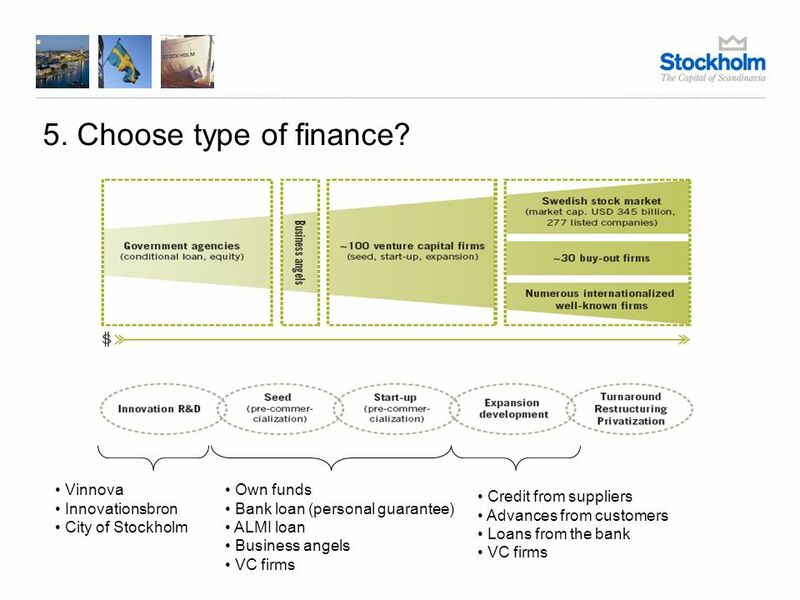 Economic association Three people are required in order to start an economic association. 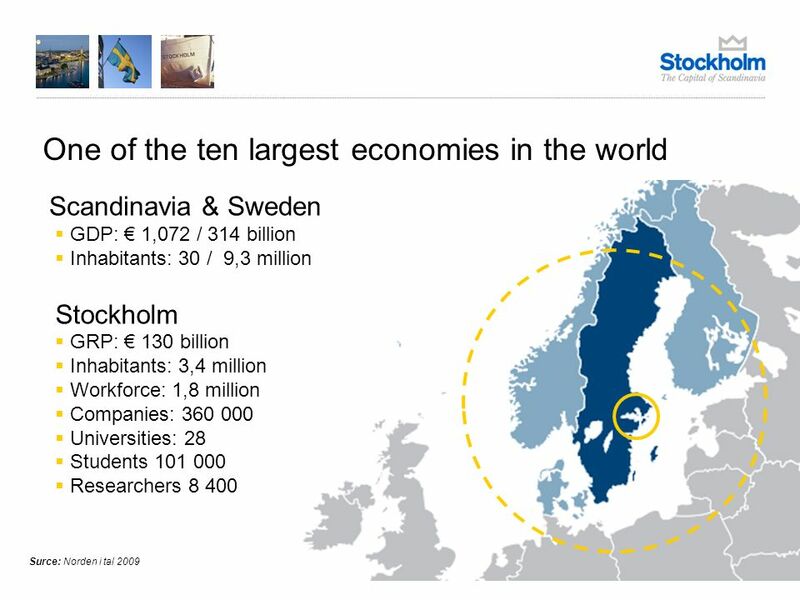 An economic association must promote the economic interests of its members. 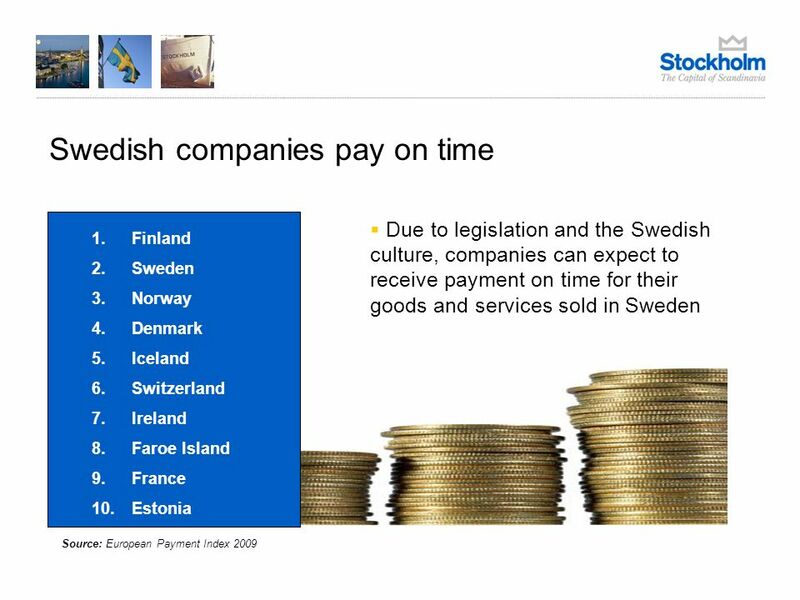 This means that the members must benefit financially from their participation in the association. 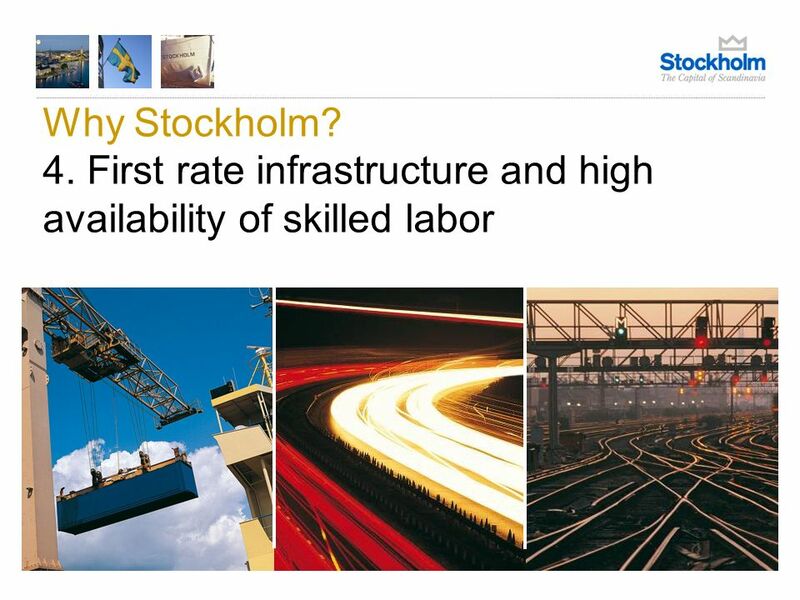 The benefit can, for example, be employment, a better price or lower costs. 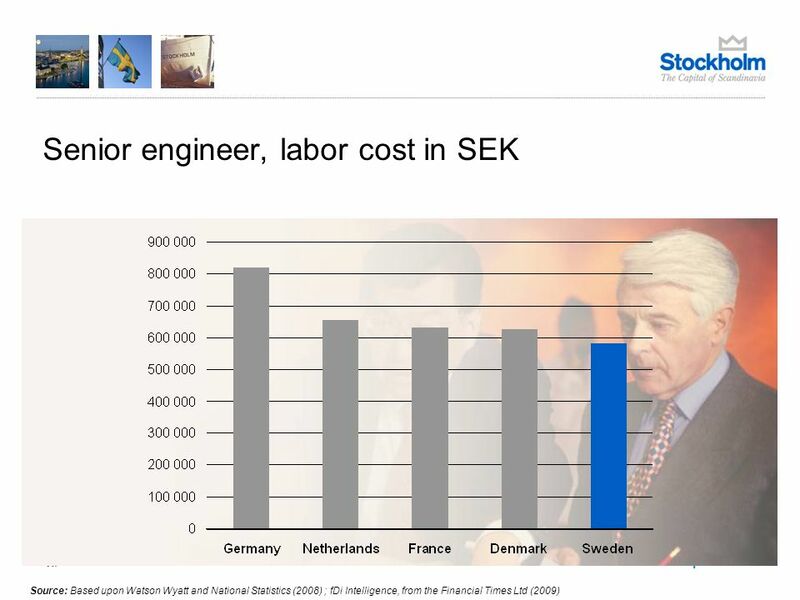 The size of the contribution each member has to pay can vary from one SEK 1 upwards. 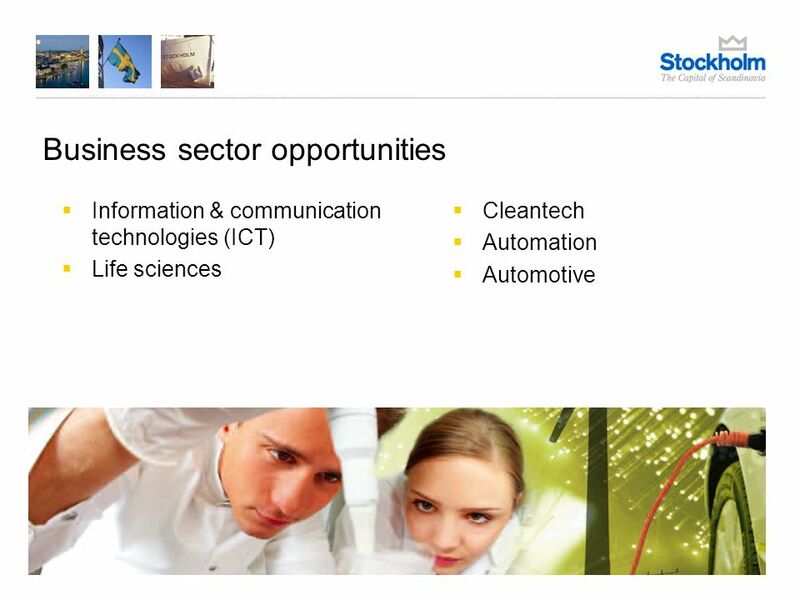 Limited liability company A limited liability company can be started by one or more individuals. 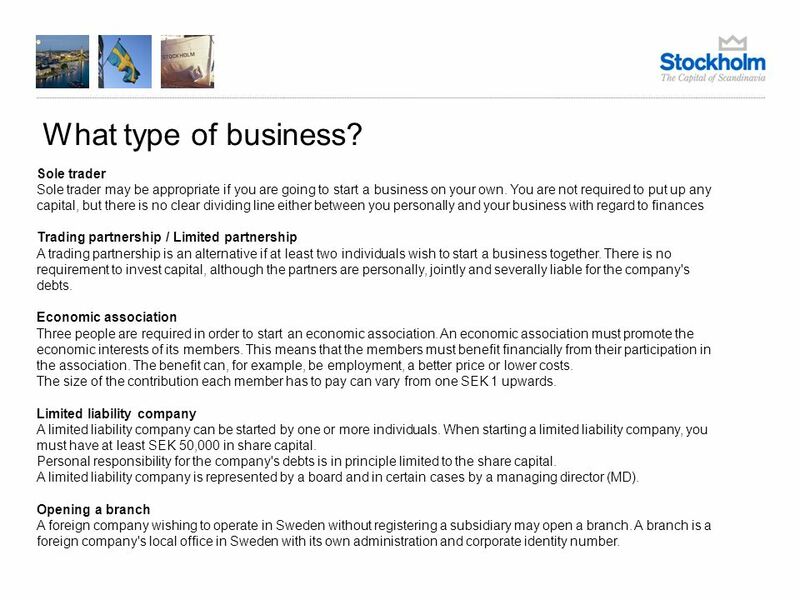 When starting a limited liability company, you must have at least SEK 50,000 in share capital. 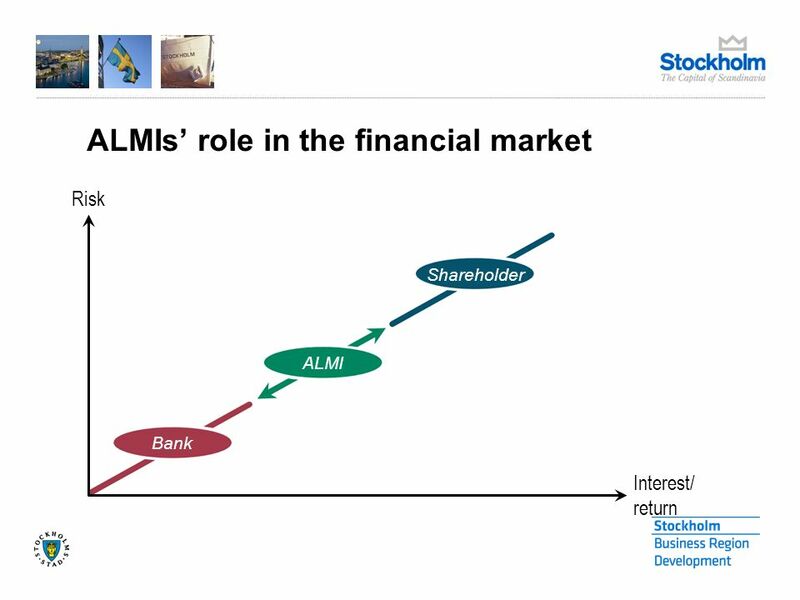 Personal responsibility for the company's debts is in principle limited to the share capital. 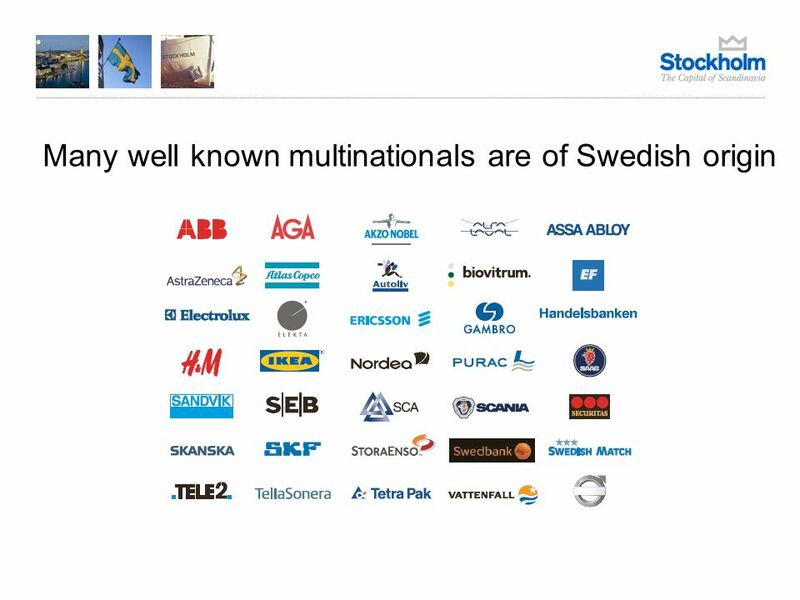 A limited liability company is represented by a board and in certain cases by a managing director (MD). 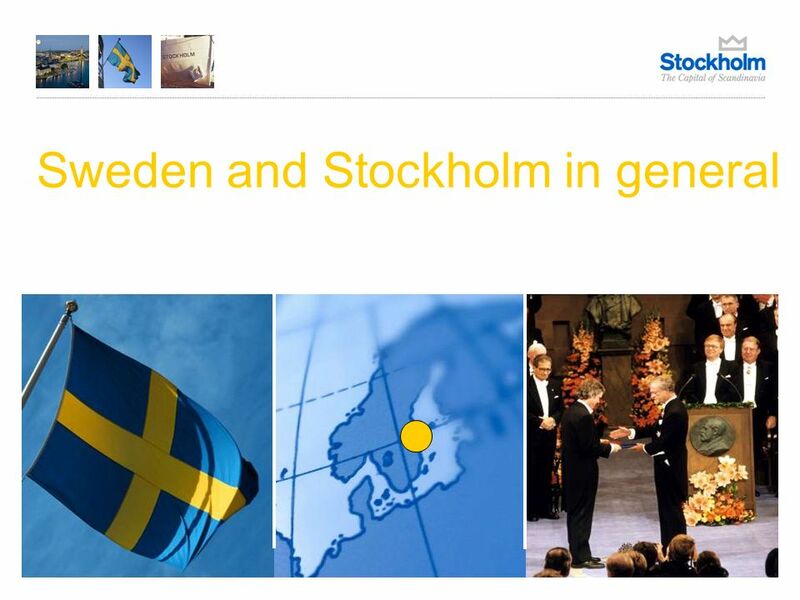 Opening a branch A foreign company wishing to operate in Sweden without registering a subsidiary may open a branch. 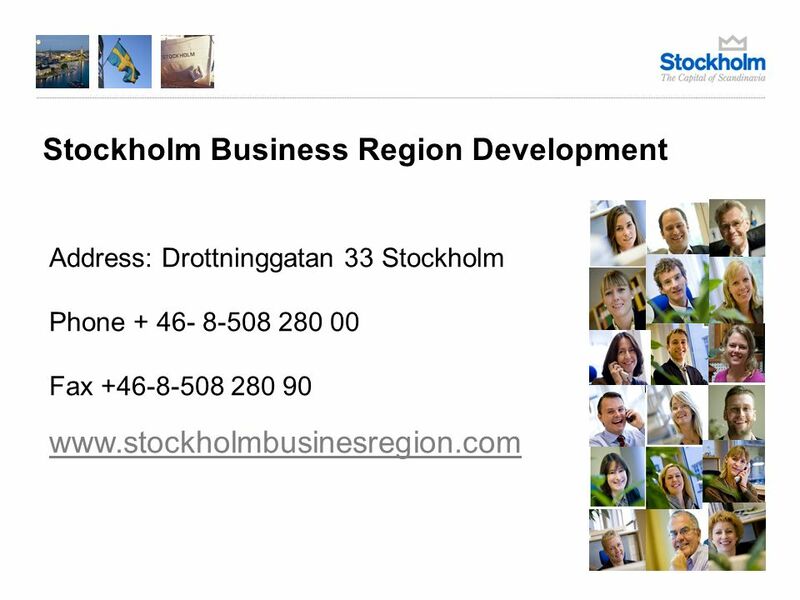 A branch is a foreign company's local office in Sweden with its own administration and corporate identity number. 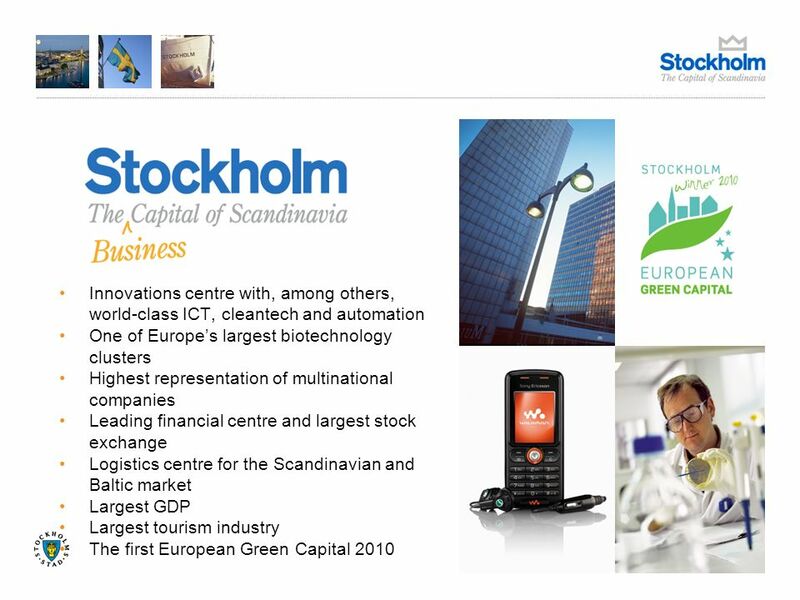 44 How to buy a hi-tech company? 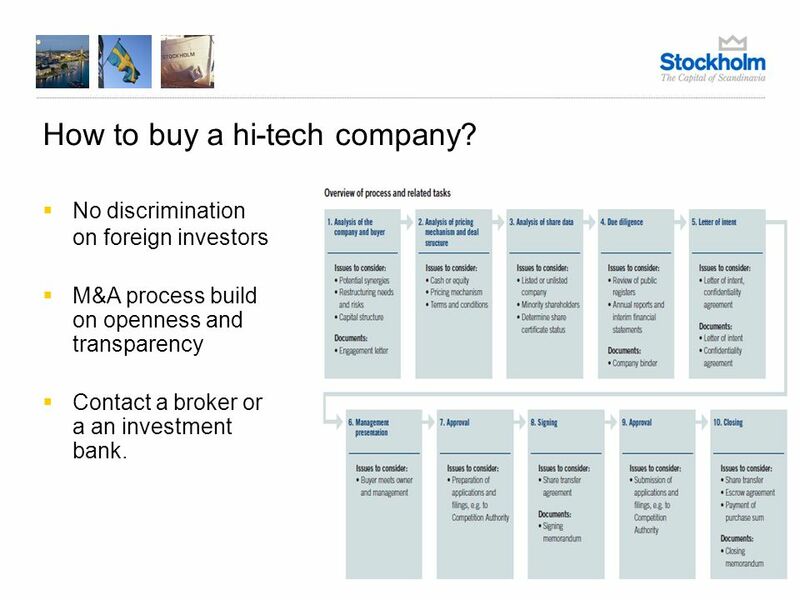 No discrimination on foreign investors M&A process build on openness and transparency Contact a broker or a an investment bank. 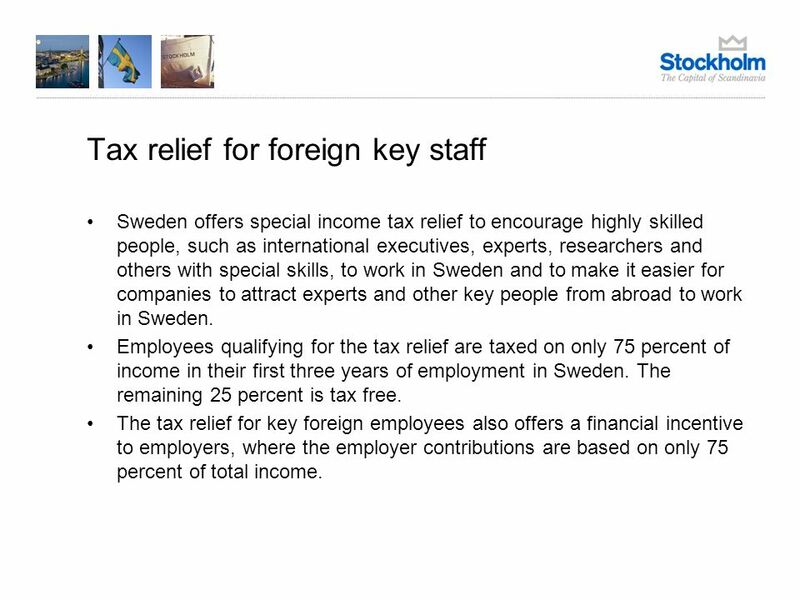 47 Tax relief for foreign key staff Sweden offers special income tax relief to encourage highly skilled people, such as international executives, experts, researchers and others with special skills, to work in Sweden and to make it easier for companies to attract experts and other key people from abroad to work in Sweden. 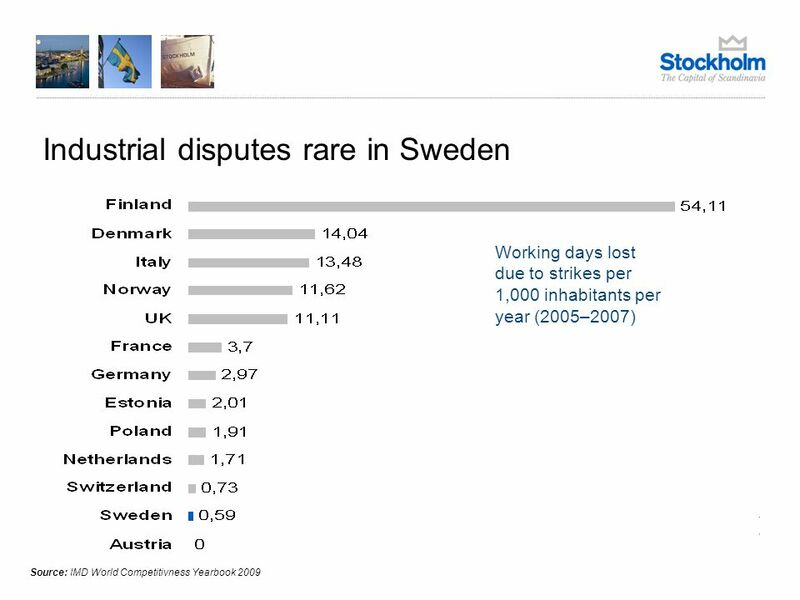 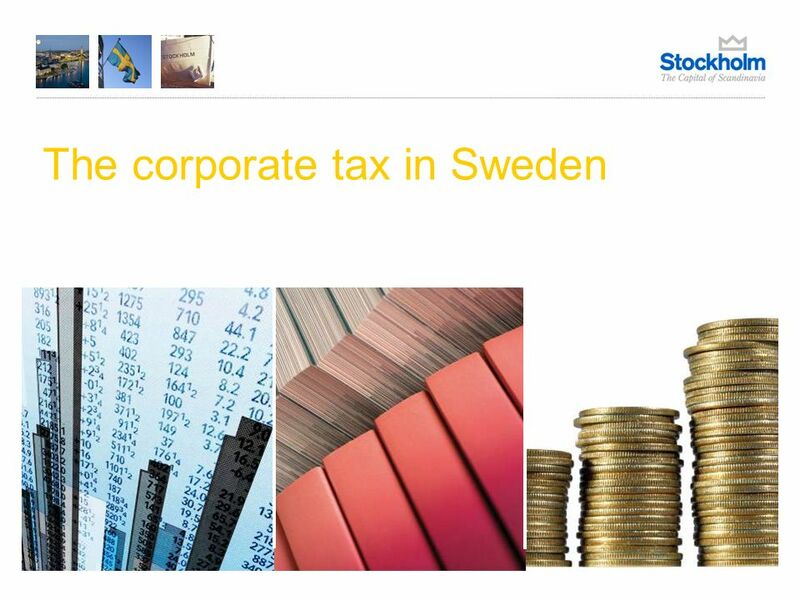 Employees qualifying for the tax relief are taxed on only 75 percent of income in their first three years of employment in Sweden. 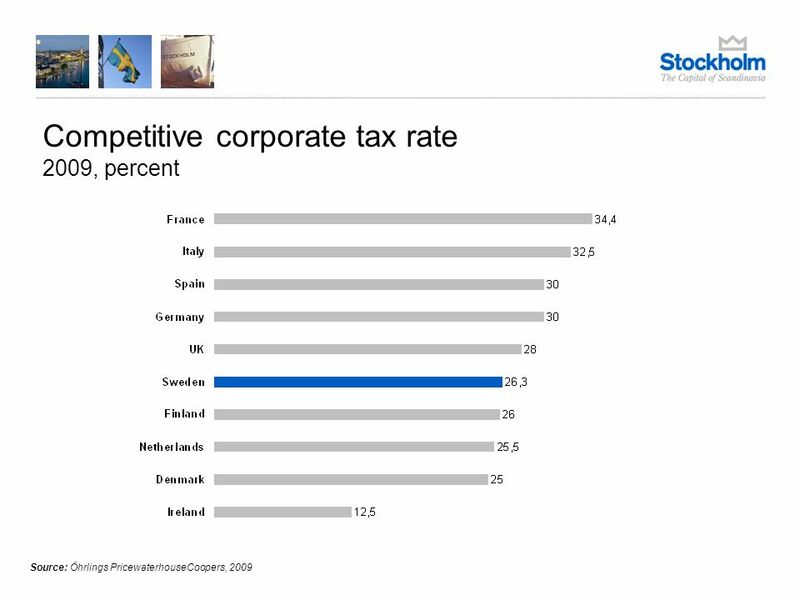 The remaining 25 percent is tax free. 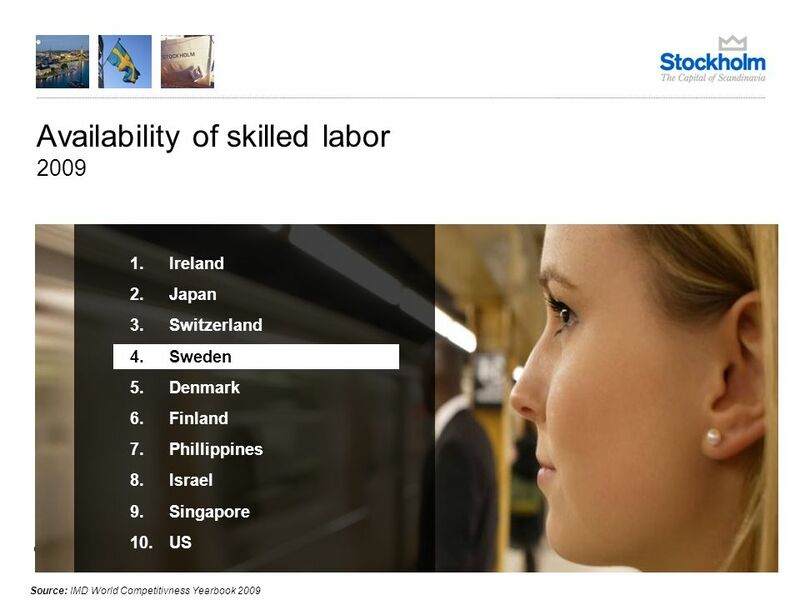 The tax relief for key foreign employees also offers a financial incentive to employers, where the employer contributions are based on only 75 percent of total income. 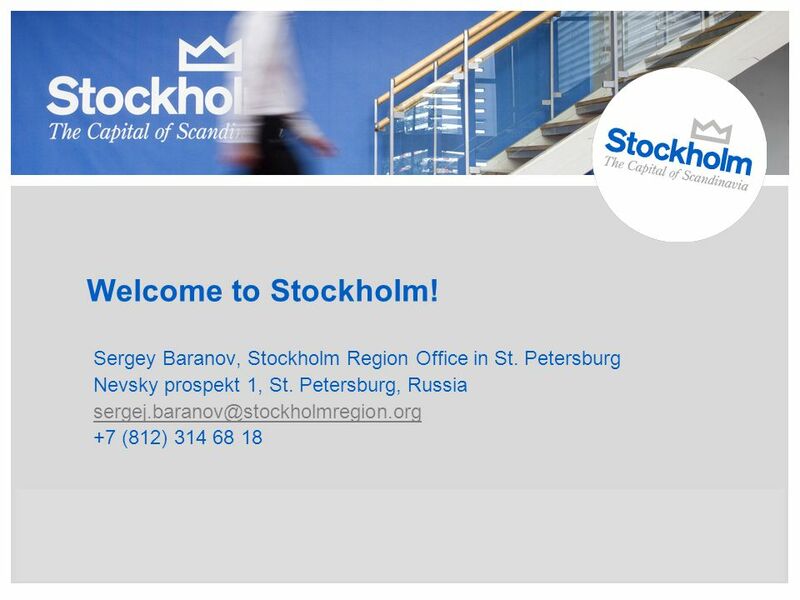 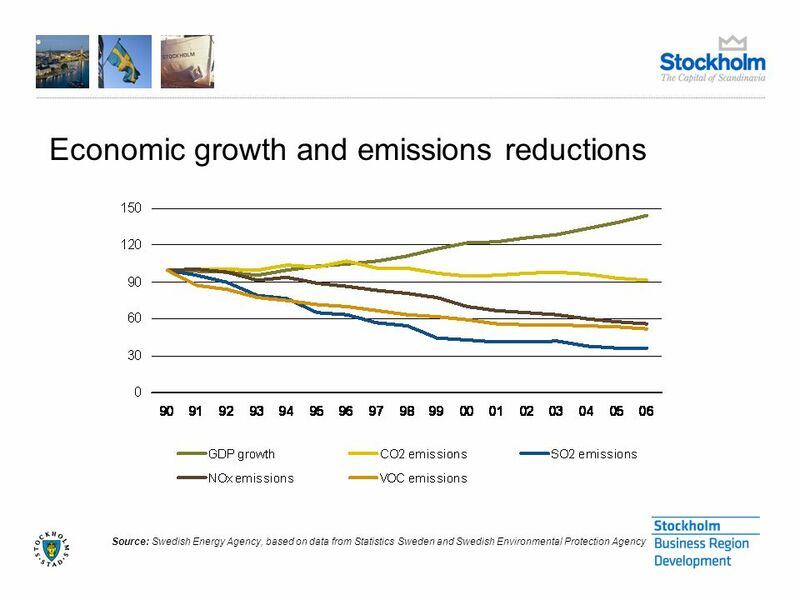 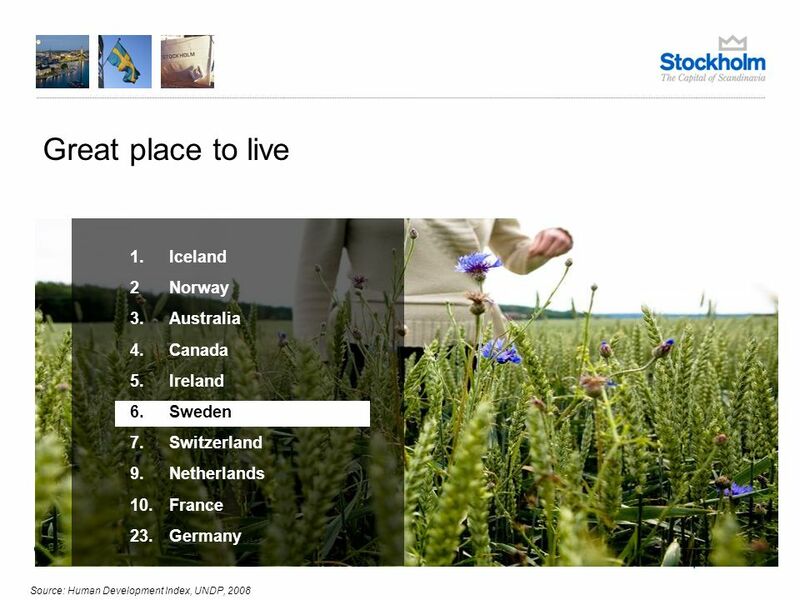 Download ppt "Welcome to Stockholm! 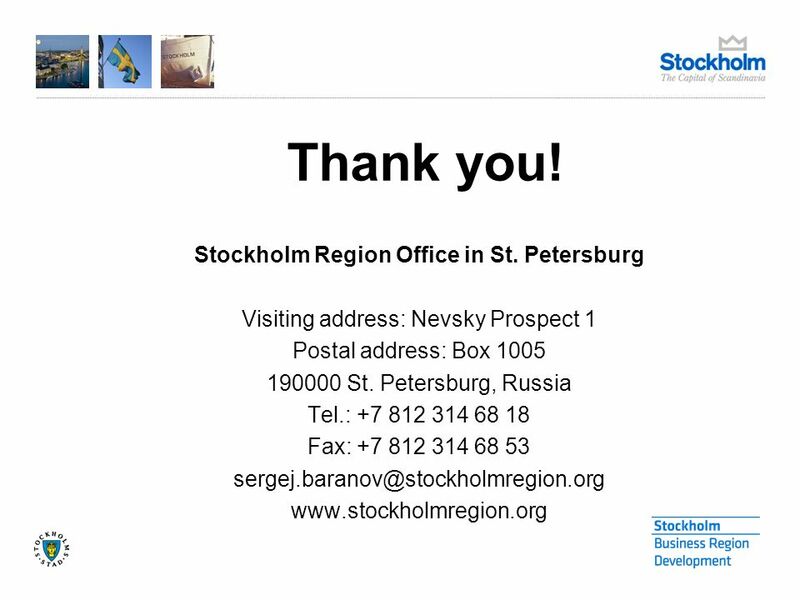 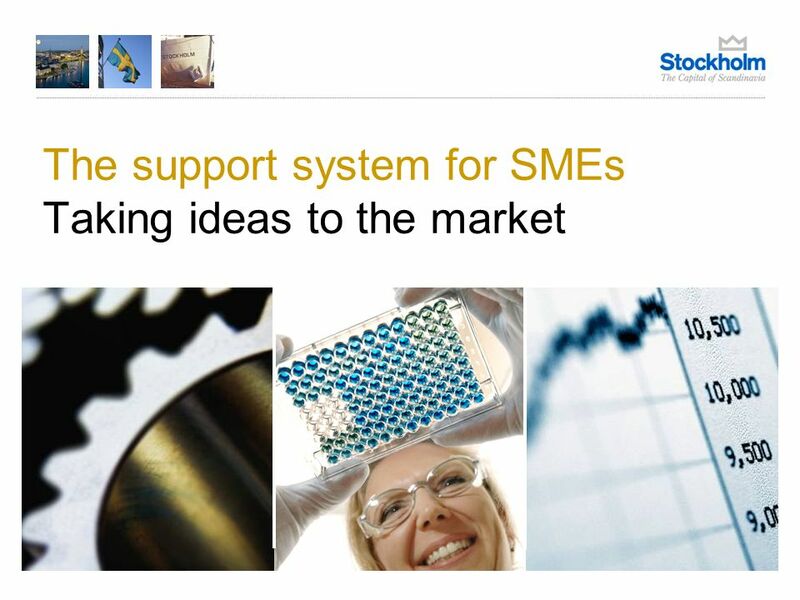 Sergey Baranov, Stockholm Region Office in St. Petersburg Nevsky prospekt 1, St. Petersburg, Russia"
Financing the Knowledge Society Seed and Venture Capital Financing, the roles of the public and the private sector Claes de Neergaard CEO Industrifonden. 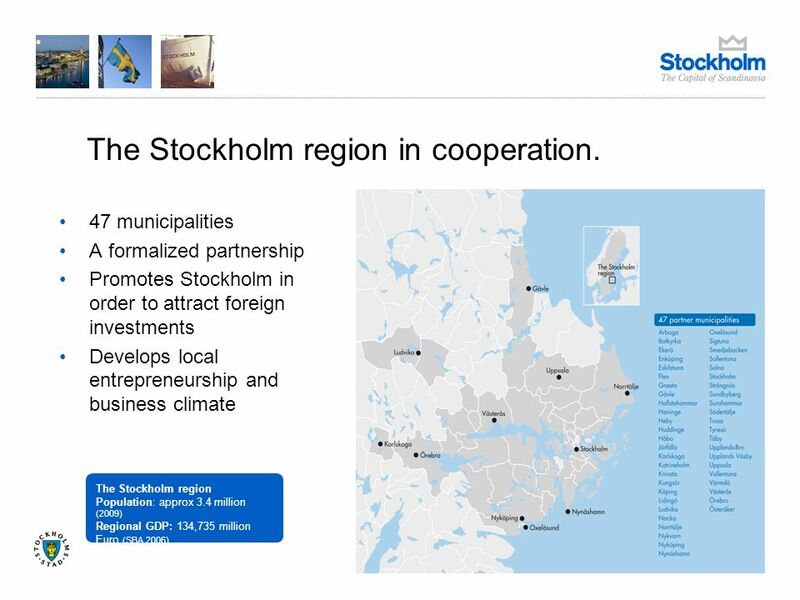 NPO HELSINKI-TALLINN EUREGIO, Promoting mobility between regions Harjumaa (Tallinn, Estonia) and Uusimaa (Helsinki, Finland) Merle Krigul Secretary General. 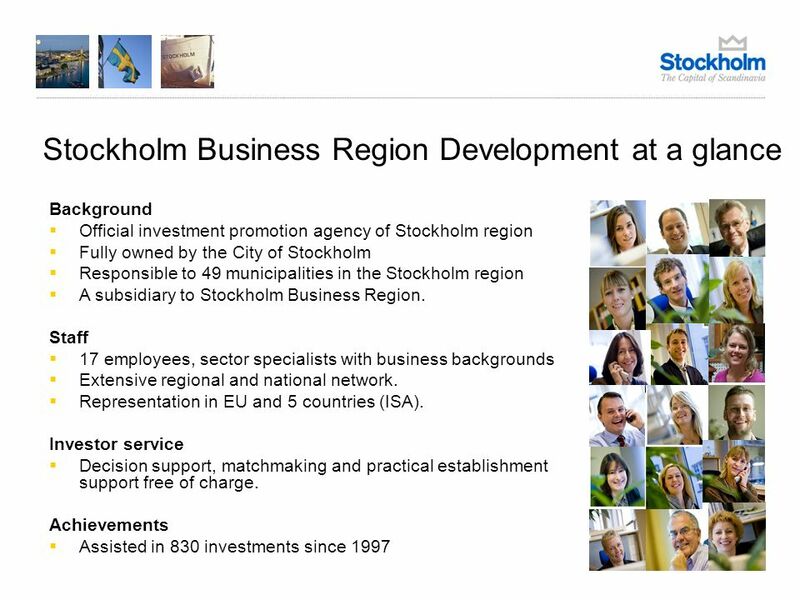 City of Aarhus Mayors Department Business and City Development Second cities and economic growth Jan Beyer Schmidt-Sørensen City of Aarhus OPEN DAYS 2009.